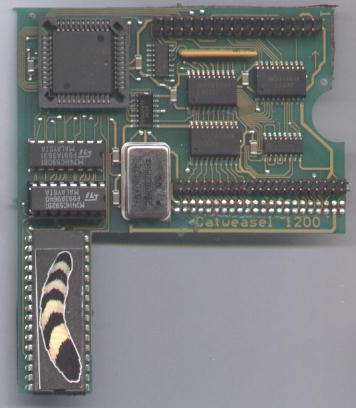 There are two main versions of the Catweasel, the A1200 version which is designed to connect to the clock port of the A1200, or in the A4000 it connects to the internal IDE port with a pass-thru for hard drives. The second version is a Zorro II card. 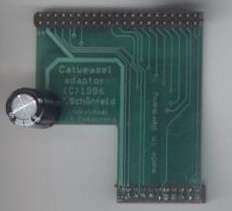 The Catweasel is a floppy drive controller for the Amiga that allows the use of up to two cheap PC floppy drives, (both 5.25", 3.5" DD and HD) for reading Amiga and PC disks aswell as many other disk formats. You cannot however boot from the floppy drives. The controller also contains sophisticated algorithms to help read failing, sensitive or corrupted disks. Reading PC formatted disks is 2.15 times faster than using a native drive, and Amiga formatted disks are 1.3 times faster. The device also supports the use of floppy controller based tape drives, with a thru-put of up to 2MB/sec. It does not support DMA, but contains a local expansion port for adding additional expansions. Page contributors: Alan Yau, Iggy Drougge, Jürgen Weiß, Michael Dittmar.